When I get a recipe in my mind, I just can’t shake it. It’s like The Blob, the old Steve McQueen movie where an amoeba-like creature takes over an unsuspecting city. 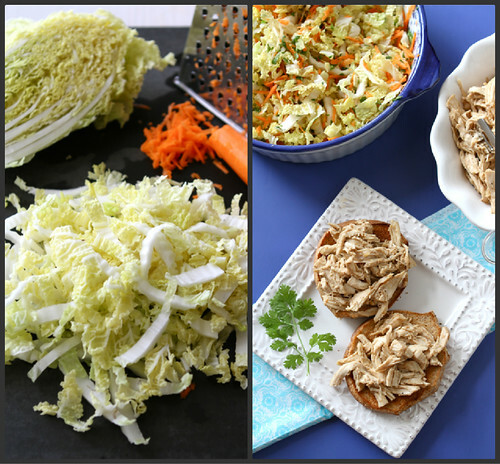 Yeah, that’s my brain, being overtaken by thoughts of Asian flavors mixed into shredded chicken and a fresh slaw. It all started when I was perusing the blog of my friend, Kalyn of Kalyn’s Kitchen. 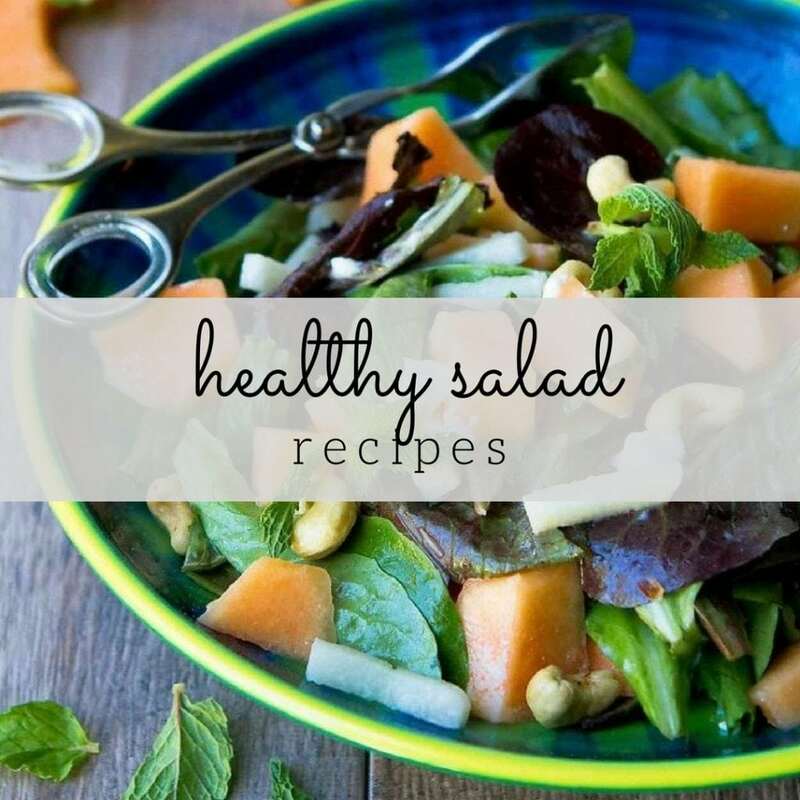 As usual, I felt inspired to get my hands on every morsel of fresh produce I could to make double and triple batches of the healthy recipes on her site. 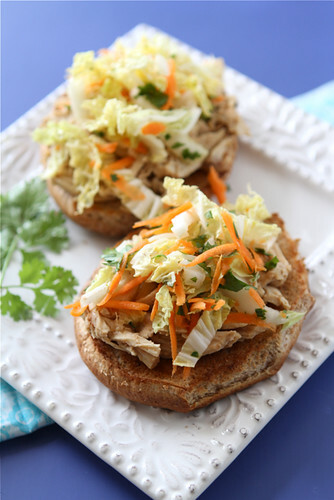 And then there was the Slow Cooker Recipe for Sriracha-Pinapple Barbecued Chicken Sandwiches with Easy Guacamole. As soon as I saw this sandwich, I knew I’d have to come up with a version of my own. When I started on my weight loss journey, one of the ways I reduced portion sizes at lunch and dinner was by making open-faced sandwiches rather full-fisted versions (under-filling sandwiches was never something I could be accused of). I found that stacking the sandwich with fresh veggies or serving it with a side salad provided enough fiber to keep me satisfied until the next meal or snack. So that’s exactly what I did with this sandwich. 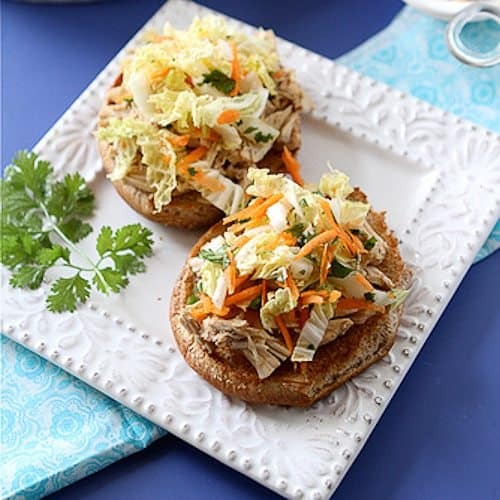 The base of the sandwich is half of a whole wheat hamburger bun, the perfect base for the sweet and savory shredded chicken and fresh Asian slaw. Now, you could try to pick it up with your hands but, if you’re like me, that will practically guarantee that the entire topping will fall into your lap. Please tell me I’m not the only one. The sauce I used to cook the chicken in the slow cooker is a familiar one for my family. It is the same one I use in my Braised Country Style Pork Ribs in Ginger Ale & Hoisin Sauce. A little bit of savory, a little bit of sweet that combines perfectly with the tangy and slightly spicy Napa cabbage slaw. Cut each chicken breast half in half lengthwise. Season with salt and pepper. Place the chicken in the slow cooker (crockpot). Heat canola oil in a large skillet set over medium heat. Add ginger and cook, stirring, for 2 minutes. Add garlic and cook for additional 30 seconds. Remove from heat. Add ginger ale, chicken broth, hoisin sauce, and soya sauce. Stir with a whisk until the hoisin sauce dissolves. Pour the liquid over the chicken. Set the slow cooker at high heat and cook for 1 hour. Turn to low heat and cook until chicken is just cooked through, 1 1/2 to 2 hours (mine took 1 1/2 hours). Remove the chicken to a cutting board, let cool slightly and shred with 2 forks or your fingers. Transfer the liquid to a medium-sized saucepan set over medium heat and boil until the sauce reduces by half. In a small bowl, stir together arrowroot or cornstarch and water. Whisk into the sacue and cook for an additional 5 minutes. 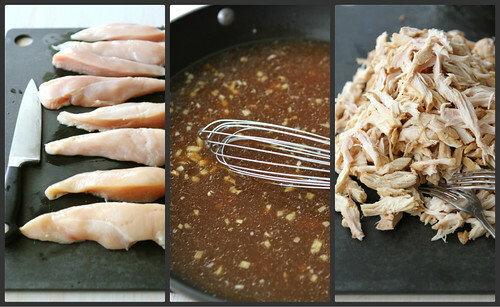 Transfer the shredded chicken and sauce back to the slow cooker and stir to combine. Set at low to keep warm. In a small bowl, whisk together rice vinegar, sugar, ginger, sesame oil, canola oil, lime zest, lime juice, and jalapeno pepper. Set aside. Separate the Napa cabbage leaves into a large bowl. Add carrots, scallions, and cilantro, and toss well. Pour the dressing into the cabbage mixture and toss again. Let stand for 10 minutes, tossing occasionally. Toast the hamburger bun halves until golden brown. 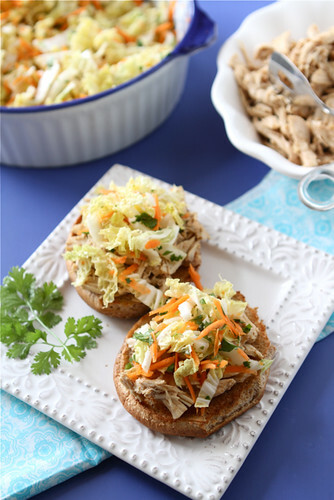 Divide the hamburger bun halves across several plates and top each with shredded chicken and the slaw. Serve any extra slaw on the side, if desired. Set the slow cooker at high heat and cook for 1 hour. Turn to low heat and cook until chicken is just cooked through, 1½ to 2 hours (mine took 1½ hours). Separate the cabbage leaves into a large bowl. Add carrots, scallions, and cilantro, and toss well. Dara, these look amazing!!! Hoisin is one of my all-time favorite ingredients. 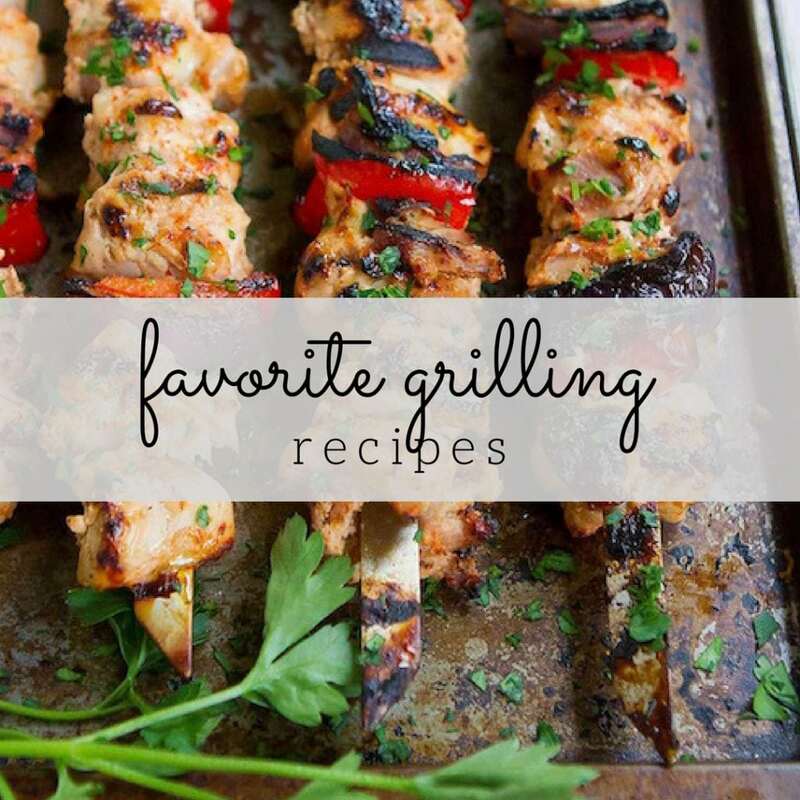 Such a great lighter recipe for summer! Amazing flavors, Dara! Only using 1/2 the bread to make a sandwich is a great tip and one that is easy to implement if you’re wanting to eat a little healthier! 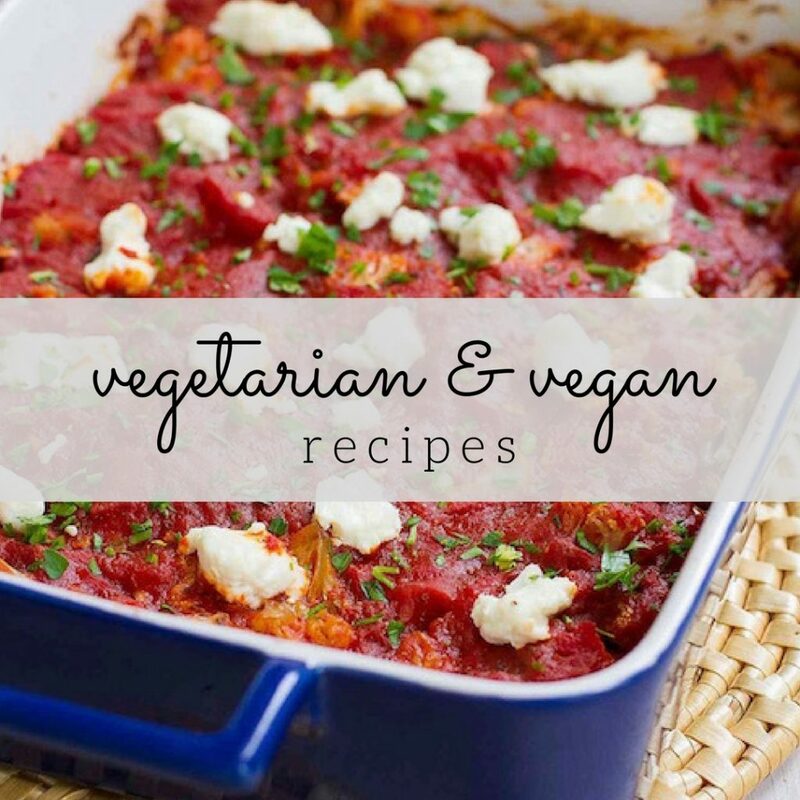 Mmm…this looks absolutely delicious! I love hoisin sauce. This would also rock as a taco. I’m liking that idea for lunch, got any leftovers? I’m the same way. Once a recipe is in my head I won’t be able to stop thinking about it until I make it. This looks great! I love the way you reduce the portion size without cutting out the flavor. Love everything about this (bookmarked!) And I do like the idea of making open-faced sandwiches. Since I am practically living on tomato sandwiches these days I need to try that with them. Yum, these sandwiches look so tasty and flavorful! Those photographs they are making me feel really hungry. Hahaha. Absolutely fabulous!!! Really well done, Dara! It sounds like very complex but clean flavors in this, I think. I’m anxious to give it a try. Looks like a sandwich I would love. Looks amazing as usual, Dara! And I am a huge fan of hoisin sauce. Not to mention every other ingredients you have listed. I just ate yet I’m still craving these. I’m going to have to try making these this weekend. Dara, these sound fabulous – I do something similar on tortillas. This is a really fabulous dish Dara. I love that you used hoisin in it. Love the taste of that stuff. This is amazing! One thing I noticed is that you reference scallions in the instructions, but don’t have it in the ingredients list. How many scallions and how should they be prepared? Thanks! Thank you for catching that, Nicole! It should be 2 scallions, thinly sliced. I’m so glad you enjoyed the sandwiches. Whoa, marvelous site design! Precisely how extended have you been blogging and site-building with regard to? you’re making blogging and site-building glimpse effortless. The complete appear of this web site is excellent, not to necessary . fabric! Thank you Dara! This was very yummy. I used Zevia Ginger Ale to decrease the sugar. What is “good quality ginger ale”? How would I know? I’m not a ginger ale connoisseur and it’s not like its quality or lack there of is plastered across the bottle. Hi there, Todd – to choose a good quality ginger ale, I suggest steering clear of the generic store-brand and mass produced ginger ales. Most well-stocked grocery stores carry bottles of smaller brewery ginger ales that tend to have a lot more flavor than most of the canned versions. And just as a reminder, there is a way to ask a question that is neither condescending nor sarcastic. You might consider doing so next time.